Глядя как Пьер Этье пользуется ХТМЛ - я считаю, что он конченный мудак и психотик. Дебильный фон, гигантская хаотично наваленная начальная страница с кучей шрифтов разннобразных размеров. Битые ссылки висят годами (почту с замечаниями он игнорит). Недавно он превзошел себя: написал статью, вставил ссылку, котораю никуда не ведет, и написал, что там БОНУС(! ),а под ней разместил статью гигантским шрифтом. Читать это на месте невозможно. Но местами очень смешно. Привожу ее сдесь. Выделения мои. WHO OR WHAT IS THE FREEZONE : (BONUS: LINKED ARTICLE CONTAINS HITHERTO UNPUBLISHED DATA ABOUT OT X: A LEVEL NAMED CHARACTER). The FREEZONE is the ANTI-THESIS of HUBBARD HCOPL "KEEPING SCIENTOLOGY WORKING", and by actual observation the more points 1-10 of that policy an individual violates the more likely and higher he/she is likely to climb and gain status there. The Free Zone is chracterized by an avoidance of discipline (in particular self-displine) in any form, Explosions of Criticism and Natter at the drop of a hat against anyone who fail to agree with one's wild ideas about how they should invent new technology or make the current one unworkable. The closest analogy to the Free Zone are the street gangs of a large Metropolis like Los Angeles. These gangs are extremely territorial, They atatck each other continuously and they view as nothing being enough of moral turpitude to forward their own perceived agenda of "Survival".Many of teh Free Zone Gangs openly endorse cyberterrorism toward those who dare "blow the whistle on their unethical actyivities". The Free Zone rejects anyone who disagree with their mainstream ideas. The mainstream ideas of the Free Zone consist of Anarchy (the rejection of any and all rules, including Standard Terms and Conditions set by internet Providers), Character assasination of anyone they hapen to dislike (See LRH Taped Laecture "WHY PEOPLE DON'T LIKE YOU" for an explanation of the phenomenon), spreading LIBEL on anyone who they perceive as "Not one of their own", and the FULL ENDORSEMENT and PRACTICE OF THE FAIR GAME LAW to anyone they view as an outsider of thi little Gang. THE FAIR GAME LAW is define as the activities a group is authorized to take toward someone it has labelled as "persona non grata". The FAIR GAME LAW, grants individuals the right to take any and all actions to take their opponent down. It specifically includes: 1-LYING to the person 2-LYING about the person. 3-Fabrication wild and vicious tales about the person. 4-Joining forces with groups opposed to the ideals of one's own group to seek to destroy the person. (i.e. joining groups that are anti Scientology and anti Hubbard Tech to attack teh individual. 5-Advocating the supression of Human Rights of that individual (i.e denying freedom of Speech, Freedom of religion,...) 6- Falsely impersonating that individual 7- Spreading disreputable and false rumopurs about the person as far and as wide as possible 8- Wilfully violating the codes they advocate believe in (such as the auditor code, the Code of a Scientologist, or the Code of Honor) when dealing with the person. 9- Accusing the person of crimes he did not commit or trying to frame the person for crimes done by the other party. The Free Zone was founded by a psychotic individual who was prone to Hallucination, kept hearing voices, especially what he claimed was Hubbard giving all forms of alleged technical instructions that contradicted the very basics of Standard Tech. The same FREEZONE founder repeatedly saw alien Invaders on every street corner and developped over two dozen "OT levels" that were exclusively dealing over those "Aliens from Andromeda" and "Markabians" who had infiltrated both the Church and the US Government, along with the World top Banks. (This is fully documented) He spent the last 5 years of his life hiding in Paris, France, convinced he was being stalked by CIA agents and Evil outer space aliens. ONE OF THOSE FREEZONE ADVOCATE, along with one of the self-appointed Free Zone authorities is now even falsely accusing me of making BOMB THREATS, while his "friend: was proudly acknowledging on another board that he is a Hate Monger, is avowed enemy of anyone who is Fat and boasting of taking pride in his own hatred. I disagree with IFA. Their president just publicly resoundly endorded a person guilty of both libel vilification toward myself and even joined recent natter about boycotting my project of building a library dedicated to MARY SUE HUBBARD. Seemingly, the communication of a PR artist who claimed "easy access" and added the heinous comment that I would be about to die (when in truth I am in better health both physically and mentally than the individual spreading those rumours) was believed in spite of tahe fact that they just erected a heavy door blocking their stairwell and more than 50 feet and 50 steps away from access to the supposed library. The same person was recently heard claiming" "There are too many people in our house". IFA certification process is entirely useless and does not pass muster by any acceptable frame of reference, as IFA certifies without examination, meaning it has no standards. On the contrary Cronyism and PR are actually used instead of careful observation and examination, the key criteria that should be used. Он где-то писал, что "в миру" работает в ИТ. Имо, здесь не неумение работать с инструментом, а неспособность посмотреть на результат своей работы глазами других. Я когда-то пытался читать сайт Кончока Пендея. Там было примерно такое оформление. Посмотрев на результаты применения УПП, я не стал его практиковать. У Этье чуть получше, но в том же направлении. If you are sincere, well mannered and honestly seeking the truth , please drop me a note and I can help you to get a response from Pierre and may be meet in person. Pierre is traveling around the Globe. 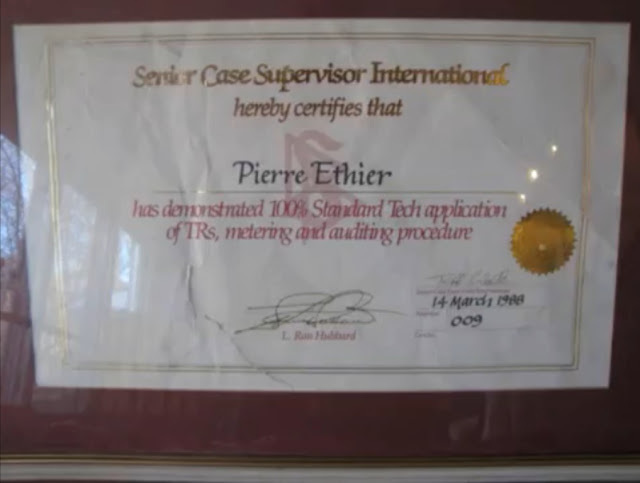 Pierre Ethier was trained in the CofS up to Class XII Auditor, and audited at FSO for 17 years. 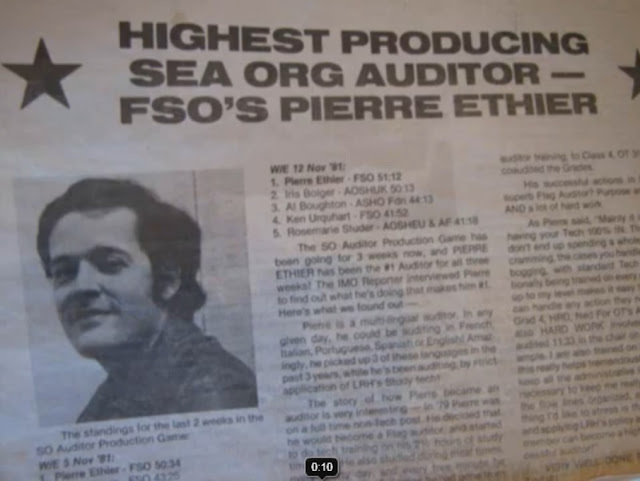 Between 1981 and 1992, Pierre Ethier was Flag top auditor every single year. Pierre Ethier spent over 20 years as a stuff member of the Church of Scientology studying the religious technology and helping people through religious counselling. After his departure from the Church in 1992, Pierre builds a very successful IT career dating back from the beginning of the internet era with the start up of the second largest ISP in the province of Quebec.. Along with his University Degree, he holds a number of current prestigious professional certifications in the IT field. 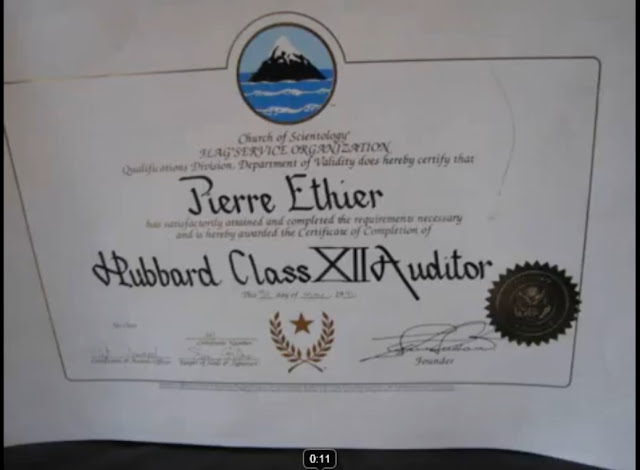 Pierre Ethier is now an independent scientology auditor who, among other services, delivers the famous "L" Rundowns in their powerful original. He speaks fluently English, French, Italian, Portuguese and Spanish. Since 2005, Pierre Ethier has been providing advanced Spiritual Counselling to people seeking to become more able by strictly applying what has been demonstrated to work and helps people attain self-fulfilment to lead more successful and happier lives. As people go closer to the Advanced Spiritual levels and find increased joy in life, their lives are affected for the better. Pierre Ethier writes: "Being a Class XII does not merely mean trained to audit the Ls as some misguided people who got hold of part the Ls and started auditing them might think. Being an authentic Class XII is many light years beyond that." The partial list of PCs Pierre Ethier has audited and published by the Church of Scientology consists of roughly 3500 people. It is by no means the complete list of the over 5000 people Pierre has audited at Flag. With virtually no exception he enjoyed auditing each of those people. Pierre is going over the list and recalling the gains and life changing improvements.His ultimate desire is for each of these people to reach happiness and spiritual Freedom, whether they achieve it in the Church of Scientology or in another. A lot of those names have not been on Flag completion list for a very long time. Each and everyone should be told that "NO CHURCH HOLDS A MONOPOLY ON SPIRITUAL FREEDOM OR THE STATES OF BEINGNESS PROMISED BY L. RON HUBBARD". Anyone can move forward from whatever point they have been stopped, betrayed or given arbitrary actions that were not designed to help them. "Pierre is charismatic, articulate, fun, and energetic. He exudes confidence and has great integrity, believes in honesty over little white lies, and compassion over cynicism. He brings passion to everything he does and to the people around him. He is naturally gifted and intelligent individual with an engaging personality. Pierre Ethier is professional, very busy, very successful, unique, unfinished, fabulously flawed, perfectly imperfect, outgoing and very loyal. He has genuine taste for the finer things in life. He is passionate about passion in life. Pierre is a versatile individual who can conform to just about any situation. He loves learning, traveling, theatre and music. Pierre is competent in many areas and able to turn with ease from one thing to another. He is open minded and non-judgmental. He cares about people. Pierre has a fondness for all the natural beauty of the great outdoors and loves to explore what Mother Nature has to offer. He is an individual with a passion about his favourite museums, art galleries and traveling abroad. Pierre loves spending a tranquil afternoon at a picturesque chateau / winery and also he appreciates the art of true fine dining with the whole culinary experience in a luxurious setting in addition to some stimulating conversation. Pierre is giving back to his community as often as possible and brings social value with the results of his professional work." Michael Moore , President of IFA writes: " Pierre climbed his way up the technical bridge whilst at Flag, despite enormous counter intention, to become one of the most highly trained and productive auditors at Flag." Надо полагать, я не из этих, раз у меня с Пьеро не склеились отношения. И потом, написать буков можно много. Автору поста предупреждение - это РУССКОязычный форум. Удалять не стану, конечно, но в будущем покоцаю без обсуждения. интересно, что происходит в сознании людей, которые делают такие сайты..
Spasiba bolshoe dlja otveta. U menja net Cyrillik azbukii. Ya stal zabiivat ruskava jaziika. Ja poljubil vashi video lekzii. Vii delaete prekrasnuyo rabotu. A pochemu ze u vas problem s Pierra? Vii vstretilis kogda on bill v Moskwe? Ya znaju evo uze 20 let. I hope you will grant me an exception to write with Latin Alphabet as my corporate computer does not allow the installation of additional Cyrillic fronts. I did allow myself to write in English because you have allowed an English exert above my post. Excuse me for my Russian , it is a bit rusty but I use to master the language. I am greatly impressed by your qualifications and I looked over your videos. Really great job. I just loved your lectures. Could you please let me know what is the problem between you and Pierre? Have you met him when he was in Moscow? Я надеюсь, что Вы будете предоставлять мне исключением писать с латинского алфавита, как мой корпоративный компьютер не позволяет установку дополнительных кириллицы фронтах. Я позволю себе писать на английском языке, потому что вы позволили английском раздел выше выше мой текст. Простите меня. Я впечатлен вашей квалификации, и я посмотрел ваше видео. Действительно хорошую работу. Я просто любил лекции. В чем проблема между вами и Пьер? Вы встречались с ним, когда он был в Москве? Благодарю вас за предоставленную мне возможность писать. Ответ : "Ваше благородие, Госпожа удача ... великая песня"